Wendy Baner The Pipe Cleaner Lady is the world’s foremost authority on Pipe Cleaners and Pipe Cleaner Art. In her years of experience she has developed certain techniques, that can have anyone addicted to pipe cleaners by the end of the event. Everyone says “Who knew you could make so many things with plain-old pipe cleaners?” after spending their time with Wendy. Years of experience teaching pipe cleaner art to young and old have lead to Wendy developing pipe cleaner shapes that make creating art quick and easy. The pre-made pipe cleaner starter items she brings with her give novices a head start making fun and fashionable pipe cleaner art right away, and give experts a speed boost making all kinds of astounding creations. For the first time anywhere, Wendy’s custom starter shapes will be available for purchase. 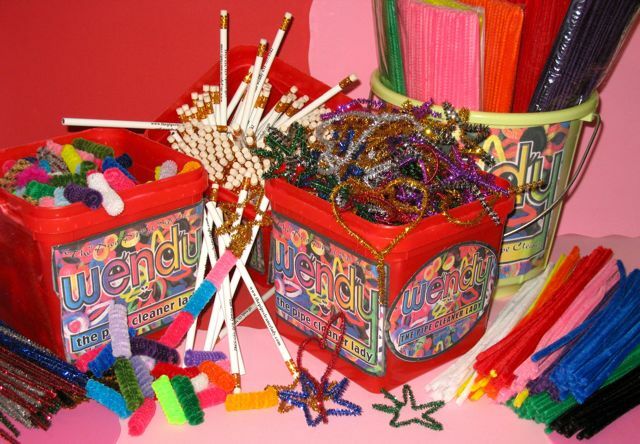 Beads, Sparkling Hearts & Stars, as well as a wide assortment of Pipe cleaner packs will be conveniently available here for sale. Our vision is to be your number one resource for Pipe Cleaners on the web. Kits, instructions, wearables, party favors, and more. Books, videos, How-tos, party-packs. all coming soon. We’d love to hear from you, what do you want from Wendy?